Whether well balanced in the hand is your razor, is heavily dependent on the weight ratio between blade and handle dependent. As a natural material give you heavy hardwoods best conditions to oppose the blade steel an adequate weight. 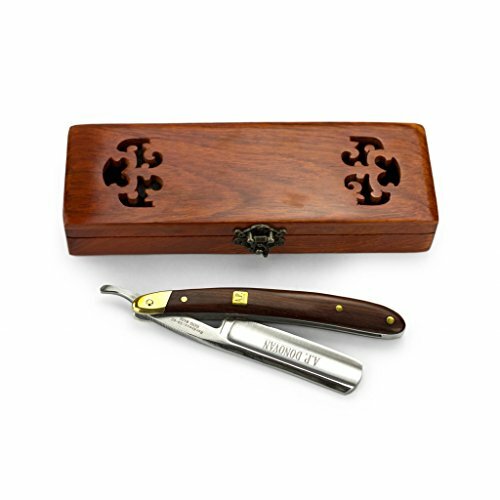 For those prepared carefully by hand grips this razor mahogany wood from the forests of Madagascar are used. You will be fascinated by this successful symbiosis of steel and precious wood. Each razor of A P. Donovan comes in a decorative real wood box. The noble character of the gift box is highlighted by arabesque carvings hole in the lid and the finely crafted metal buckle. A velourbeschichtete foam insert inside reliably prevents scratches on handle and blade razor. As a personal gift case or for safe transport for traveling: This box proves a quality razor honor. Only when high-quality materials, stylish design and effective functionality are perfectly combined in a single product, says AP Donovan: Okay, so we do it! Our passion is to give everyday objects of the male everyday upgraded. And not to the next possible, but the highest possible level. A good razor is sharp. A razor of A.P. Donovan is sharp and beautiful. Consistently well products for consistently living man! If you have any questions about this product by A.P. Donovan, contact us by completing and submitting the form below. If you are looking for a specif part number, please include it with your message.